For a team which is set to begin its 2019 World Cup qualifying campaign in two months, last night’s friendly match against Panama was almost exactly what the doctor ordered. 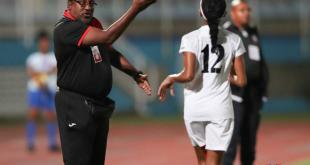 So says Trinidad and Tobago Senior Women’s team head coach Jamaal Shabazz whose side has had to endure a year of inactivity. A 1-2 defeat at the feet of their Central American opponents, who had been inactive in international play for 18 months, was not the ideal prescription for the hosts, who would obviously have preferred a victory. However, speaking at the post-game briefing at the Ato Boldon Stadium in Couva, Shabazz said he did not want his charges to dwell too much on the result. 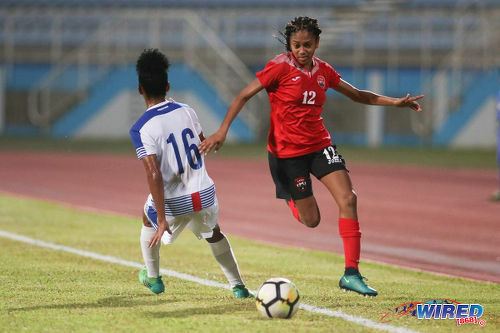 Photo: Trinidad and Tobago winger Shanelle Arjoon (right) skips past Panama right-back Katherine Castillo during international friendly action at the Ato Boldon Stadium on 22 March, 2018. 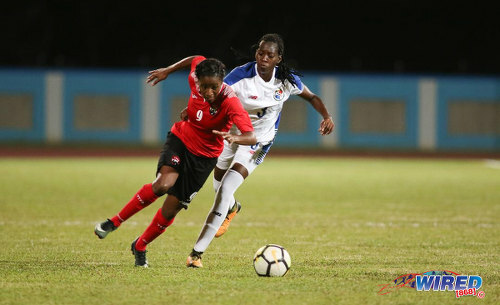 Their performance and the degree to which they were able to apply what they have been doing on the training pitch is what Shabazz sees as the key indicators as the Women Soca Warriors look to embark on a historic journey to France 2019. 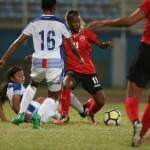 Trinidad and Tobago took the lead through a bullet header near the half-hour mark from winger Shanelle Arjoon, for whom Shabazz had high praises. However, in the opening passages of play, the hosts were quite sluggish, failing to string more than a few passes together in any one move. Shabazz admitted that his charges were off the pace. Like the hosts, Panama were sluggish in the early stages. However, the visitors always looked a threat when skipper Natalia Mills got on the ball down the left flank. Often, right-back Patrice Superville reacted slowly to Mills’ off-the-ball movement. Photo: Trinidad and Tobago forward Andrea Young (right) looks to peel away from Panama right-back Katherine Castillo during international friendly action at the Ato Boldon Stadium on 22 March, 2018. It finally cost the home side in the 36th minute, when the Panamanian skipper restored parity after Karla Riley played a neat through ball into her path from the right side of the box. Not for the first time, Superville was in no woman’s land and Mills had all day to pick her spot, which she did with aplomb. After his side gave up another simple goal to the visitors mere minutes later, Shabazz opted to swap his full-backs for the start of the second period, Superville going to left-back and Jonelle Cato occupied the right-back position. The hosts afforded Mills way too much time and space down the flanks and Shabazz blamed the absence of chemistry in the backline for his team’s performance on the defensive end. Swapping wing-backs was not the only tactical adjustment Shabazz made for the second half. 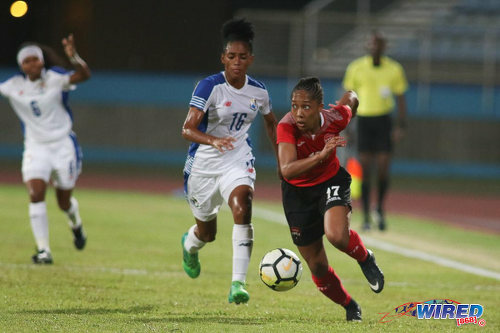 Skipper Tasha St Louis was shifted from her defensive midfield role alongside Karyn Forbes to a more familiar position at the apex of the Women Soca Warriors’ attack. While in midfield, in an attempt to wrest possession from Panama, St Louis tried to compliment Forbes’ robust play with aggression of her own. Photo: Trinidad and Tobago captain and attacker Tasha St Louis (centre) tries to keep control of the ball during international friendly action against Panama at the Ato Boldon Stadium on 22 March, 2018. However, the 34-year-old attacker looked much more comfortable up top and she was a real livewire for the hosts in the second half. Unfortunately for St Louis, she had to do more and more of the heavy lifting on her own as the game wore on and it proved to be too much to ask. Shabazz noted that there was an improved display in the second half, with the hosts showing much more urgency and identified the St Louis change as playing a part in that. He indicated that St Louis may well have a free role in the team going forward since he does not think that a player with her versatility should be confined to just one position. “Tasha is very flexible,” Shabazz noted. “She is one of the best [players in the squad]. She can play all over the field and anywhere […] in the midfield or up top. We try not to define a specific role for her; we allow her to be very flexible and make decisions which she wants to make. 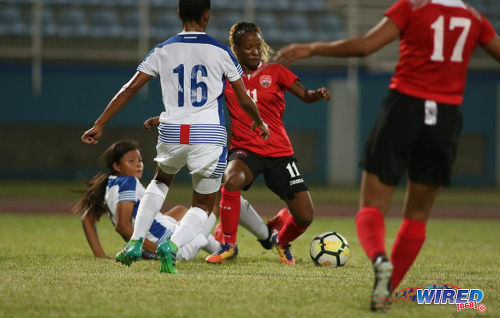 For a split second in the 49th minute, Trinidad and Tobago looked certain to get back on level terms after a right-side Mariah Shade cross was tipped on to the bar by goalie Yenith Bailey. However, with the goal at her mercy, Arjoon had a wild, right-footed swing at the ball and the shot might well have ended up giving Panama a throw-in near the corner flag. Seconds later, St Louis manufactured a left-footed shot with a smooth swivel in the area, forcing a smart, low save from Bailey. 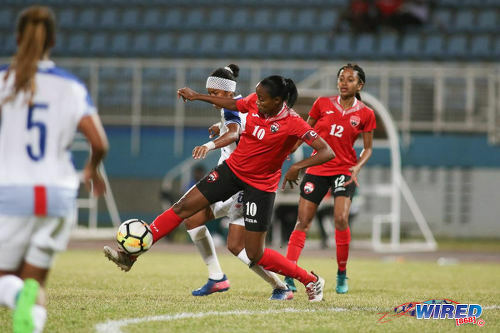 Photo: Trinidad and Tobago midfielder Janine Francois (centre) prepares to shoot at goal during international friendly action against Panama at the Ato Boldon Stadium on 22 March, 2018. St Louis is one of the surviving members from this country’s captivating 2015 World Cup campaign, which saw coach Randy Waldrum’s team just one win away from their maiden World Cup appearance. Shabazz suggested that his captain would have conjured an equaliser if she still possessed the sharpness of years gone by. 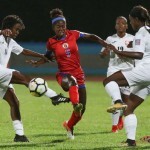 After the second encounter with Panama on Saturday, when the Women’s Senior Team coach is hoping to exact swift revenge on the visitors, this country will next month play hosts to one of the groups in the Caribbean Football Union (CFU) Women’s Challenge Series before beginning their World Cup bid in May. Despite being pegged back by the visitors in the latter stages of the contest—as many as ten T&T players were often in their own half—through good Panamanian pressing and composed midfield play by Aldrith Quintero, Shabazz reckons that his team’s fitness is at a good level. However, he’s hopeful of adding some new names to bolster the squad for the two upcoming tournaments. “I though their fitness was good, eh,” Shabazz said. 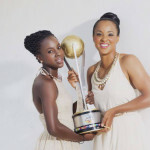 “We never waned during the game and this team has been training for a while. The Caribbean Women’s Challenge Series is another step in our preparations and we are going to get some more players coming in and we look forward to that tournament and playing at home also. 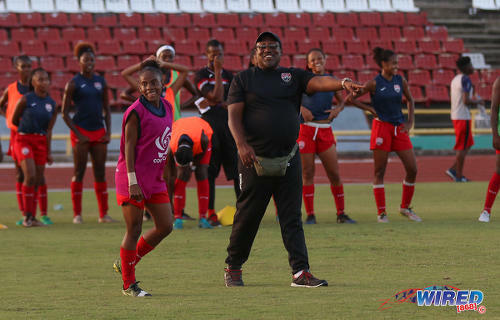 Photo: Trinidad and Tobago women’s coach Jamaal Shabazz (right) instructs attacker Aaliyah Prince during National Under-20 Team practice at the Hasely Crawford Stadium on 9 January, 2018. With many senior players either injured, uninterested or abroad on duty, Shabazz again reiterated that the player pool is not as large as people may think. One such player who has lost interest in the game, according to Shabazz, is Anique Walker. Defender Rhea Belgrave and midfielder Victoria Swift, however are still part of his plans for this year but both are injured. Shabazz also remains hopeful that both Cordner and former team captain Maylee Attin-Johnson will again be part of his set-up once World Cup qualifying commences. “The pool is not a large one,” Shabazz noted, pointing to the difficulty he has in replacing former Sweden-based winger Ahkeela Mollon. “It’s not like the one we had in 2014. Some of those players have lost an interest in the game. 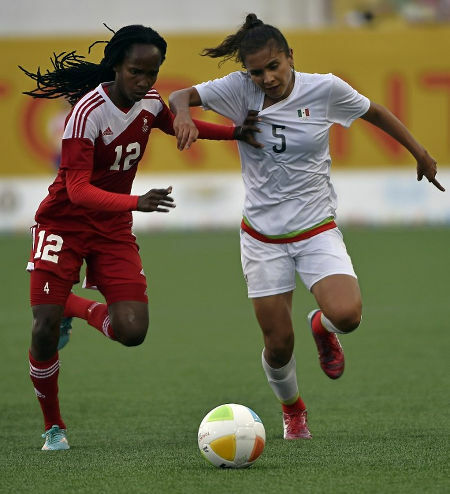 Photo: Trinidad and Tobago winger Ahkeela Mollon (left) holds off Mexico’s Valeria Miranda in an encounter during the Toronto 2015 Pan American Games. Arjoon, newcomer Andrea Young and National Under-20 players such as Kedie Johnson and Aaliyah Prince may have some really big shoes to fill down the wing then. And Shabazz noted that he will give a run-out to a few more Under-20 players tomorrow. Whoever takes the field at the Mannie Ramjohn Stadium in Marabella tomorrow, Shabazz can be certain that the visitors will try to impose their possession-based game. Last night, the Panama team, which has been in training for two months, did a very good job of that and Mills, Quintero and Riley were very good in that regard. Katherine Castillo and Kenia Rangel also showed good understanding down the right flank. Tomorrow, Shabazz would like his team to give the Central Americans a taste of their own medicine. Photo: Trinidad and Tobago attacker Mariah Shade (left) tries to escape from Panama left-back Maria Murillo during international friendly action at the Ato Boldon Stadium on 22 March, 2018. For Panama, tomorrow is about building confidence and minimising the fear factor for when their own World Cup qualifying campaign gets going in a few months’ time. Ideally, for Shabazz and the supporting public, tomorrow’s 4pm game will shatter Panamanian confidence and significantly boost Trinidad and Tobago’s. It’s a shame about Anique Walker. I thought she had what it took to be a key component of our Women’s programme for years to come. Yeah. Anique, thoughts of a comeback? She was given as an example, she hasn’t been the only one over the years. All we do here (online) is lament how poor ALL the different mechanisms of the TTFA is from top to bottom. It was pretty quiet outside the stadium last evening though..we jay walkers did not realise a game was going on..No one had to Park on rivulet Rd. I am not sure why he is mentioning ‘rust’ if they have been training for 13 months. After 13 months in training, I hoped to see better. But at least they are getting good warm up for their World Cup qualifying series. He mentioned players losing interest. Would that have happened with the program being run in a professional manner? Let’s hope that it gets better …. the girls need a positive result.